We’re building a site that we want people to love using, so we want as much feedback on it as we can get. From the get-go, we’ve had a big red UserVoice ‘Feedback’ button on the lefthand site of every page. But only a tiny proportion of our users ever suggested, voted or commented on an idea. I’m not surprised. 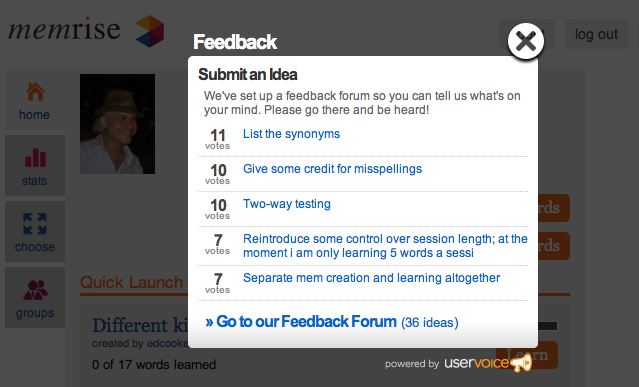 When you click the UserVoice ‘Feedback’ button, it brings up a list of the top few existing ideas to vote on, plus a vague invitation to ‘go to our feedback forum’. If the problem you’re having is on that list, then you’re in great shape. But if you have a particular suggestion to make, there is nowhere to do so. In this respect, the ‘submit an idea’ heading is misleading since this box doesn’t really let you do that. My guess is that not many people really notice the link at the bottom of the box to the feedback forum. This is a shame, because the forum itself is well-designed. It has a nice big box to add a new suggestion. It does a good job of minimizing duplicates by pointing out ideas that have already been submitted as you type. And the idea of giving users 10 votes to spend is enticing, and a rich source of information. – For the reasons described above, only a vanishingly small proportion of people who have something to say end up submitting/voting/commenting on an idea through UserVoice. – We’re trying to be thrifty, and our userbase is small. So we don’t want to pay for the much more expensive plans – this cheaper plan doesn’t allow us to transfer our users’ login status from Memrise to UserVoice. As a result, many ideas get submitted anonymously, which makes it harder for us to engage in a conversation with a user . Of course, people can create an account on UserVoice, but that’s a huge pain. – By emphasising the top ideas, there’s a rich-get-richer effect. People vote most often on the ideas presented at the top of the list, and don’t notice potentially more interesting ideas just below. UserVoice should hide how many votes each idea has already accrued until you’ve already voted – otherwise an idea’s future popularity will be largely determined by its existing popularity. – The red Feedback button was ubiquitous, but I bet that made it effectively invisible. Our feedback box gets presented opportunely and prominently at the end of every learning session, at a moment when people will be most likely to have something they want to tell us. – We get an email every time someone drops in a suggestion, with the user’s email address, so we can respond quickly to them individually. We very much want to follow up with people that have made the effort to give us feedback. I’d say we’re getting at least 5 times as many suggestions as we were. On the downside, we don’t have a nice communal forum any more that allows people to vote or comment on one another’s ideas – we might do something about that in the future. – Make it much easier for people to suggest new ideas. Even if it were to bring down the overall quality, I think an increased volume of raw responses would be of greater value. – Charge straightforwardly based on the number of new suggestions. This would set up the right incentives for UserVoice to make it really easy for users to make new suggestions. N.B. I don’t have a problem with paying – I just don’t want to be forced to start out with a $100/mo plan when we have a tiny userbase in order to get features that I consider essential to the user experience. – Corollary: Don’t withhold important features like single sign-on and white labeling the design for the exorbitant options. We compared UserVoice and GetSatisfaction pretty closely, and they both hike the prices if you want to be able to transfer login status across. In fact, GetSatisfaction didn’t (at least at the time) allow anonymous suggestions, which felt like a huge barrier to entry to new submissions – this was what convinced me to try UserVoice in the first place. Hmm – perhaps this should be a command, e.g. ‘Tell us what we can do to improve things’? Posted on December 21, 2010 by gregdetre. This entry was posted in Memrise, user interfaces. Bookmark the permalink.